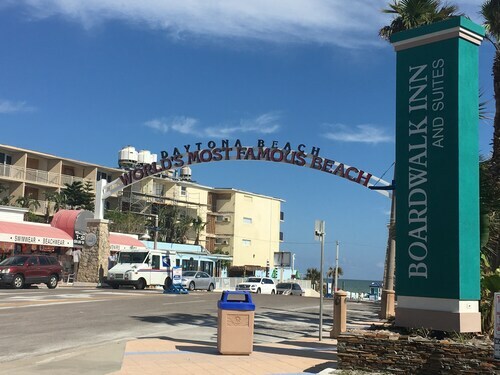 Located in Daytona Beach, this beachfront hotel is in the entertainment district and within a 15-minute walk of Beach at Daytona Beach, Daytona Beach Boardwalk, and Daytona Beach Bandshell. Ocean Center and Boardwalk Amusement Area and Pier are also within 1 mi (2 km). Tucked away on a secluded stretch of unspoiled Atlantic coast on over 2 miles of pristine beaches, this destination resort and private club features upscale accommodations and an extensive list of amenities. Boardwalk Inn and Suites offers free valet parking, so guests can leave their cars to stroll along the beach and boardwalk, lined with shops. Daytona Lagoon Waterpark is a 5-minute cab ride from the hotel. Others might want to drive 15 minutes to a NASCAR race at Daytona International Speedway. 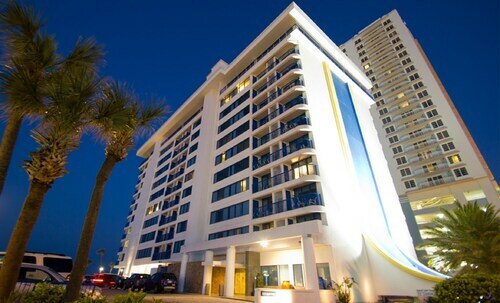 Nestled on the beach, this Daytona Beach Shores hotel is within 1 mi (2 km) of Dahlia Avenue Park and Beach at Daytona Beach. Sunglow Pier and Daytona Beach Drive-In Church are also within 15 minutes. 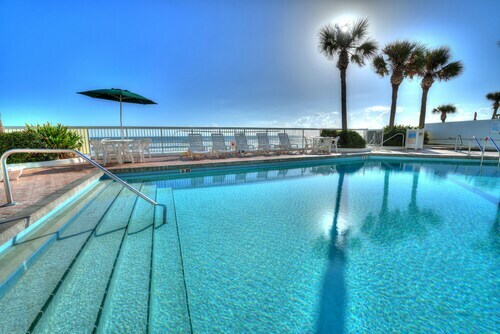 Situated on the waterfront, this condo building is steps from 27th Avenue Park and New Smyrna Beach. Our Lady Star of The Sea Catholic Church and Indian River Lagoon Park are also within 15 minutes. 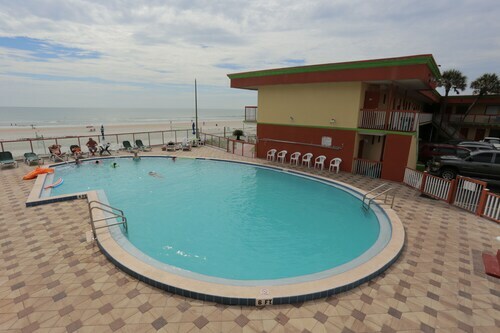 Located in Daytona Beach Shores, this oceanfront hotel is three miles from the Daytona Beach Pier, four miles from Ocean Walk Village, and about ten miles from the Daytona International Speedway. 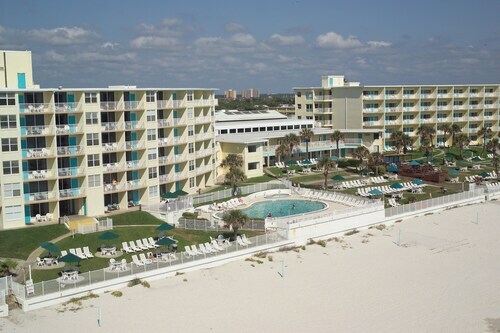 Located in Daytona Beach Shores, this beachfront hotel is in the entertainment district and within 1 mi (2 km) of Hawaiian Falls Mini Golf and Beach at Daytona Beach. Boardwalk Amusement Area and Pier and Ocean Center are also within 3 mi (5 km). 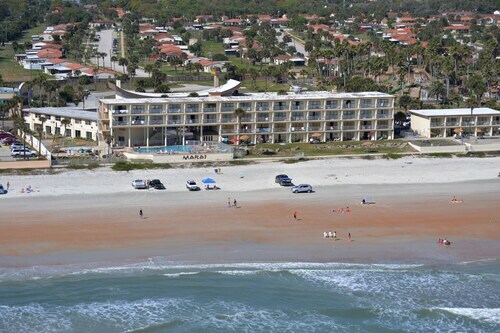 How Much is a Hotel Room in Daytona Beach? 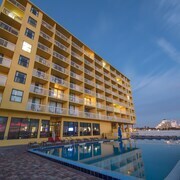 Hotels in Daytona Beach start at $61 per night. Prices and availability subject to change. Additional terms may apply. You dream about a life of endless globe-trotting, moving breezily from one exotic location to the next, wind in your face without a care in the world. It’s great daydream fuel, anyway, for interminable afternoons spent in company meetings, paying the bills, or tending to your collection of prize-winning root vegetables. Your most frequently recurring daydream puts you behind the wheel, hands at “ten and two, forearms tense as you enter the banked turn at 200 miles per hour with the world blurring past you. But just because a life of globe-trotting and high-speed exploits isn’t your reality (yet), it doesn’t mean an exciting, memorable trip is out of reach, even if only for a brief sojourn. Lucky for you and your thirst for adventure, just steps outside Daytona Beach hotels, you’ll find options that will transport you far from the daily grind without the long plane rides. 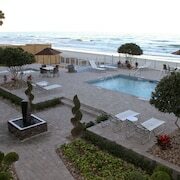 Where Are the Best Places to Stay in Daytona Beach? Plaza Resort & Spa: This cozy retreat understands that the devil is in the details—and that is what makes this place stand out from the rest. Upon check-in, guests receive two bottles of premium water and a beverage voucher good at any of the four on-site eateries. 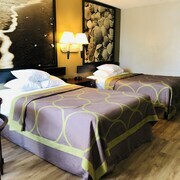 The guestroom décor features warm hues and rich tropical woods that complement the in-room technologies like a 42” HDTV, free Wi-Fi, and alarm clock with iPod docking station. After a long day of counting clouds in the Florida sky, pamper yourself with one of the many rejuvenating treatments at the hotel’s Ocean Waters Spa. 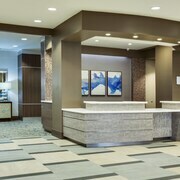 Hilton Daytona Beach Oceanfront Resort: They say location is everything. 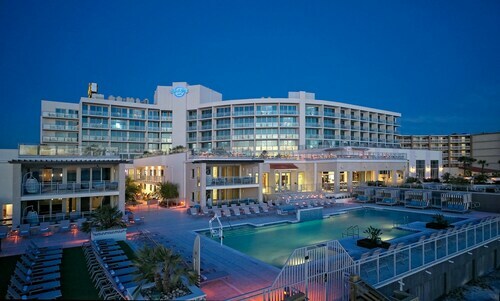 Positioned in the heart of Ocean Walk Village, the hotel’s front steps lead right into the white sugary sand, and just behind the property is the Ocean Center—a 205,000 square foot convention, event, and entertainment complex. Guests can select from ocean-view rooms, upscale suites, or beachfront cabanas to call home between sessions in the sun. Cool off in either of two pools, unwind at the spa, or find the perfect gift for that special someone at the Ocean Walk Shoppes. 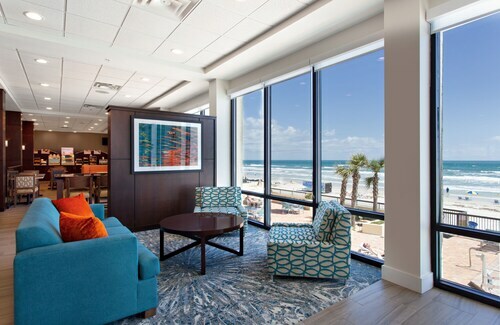 Daytona Beach Resort & Conference Center: They could have named this place “Two Birds, One Stone” thanks to its world-class resort amenities and impressive event facilities. Resort guests enjoy condo-style rooms that have kitchenettes with a 2-burner stove, full size refrigerator, and microwave oven. Convention attendees can take advantage of over 17,000 square feet of flexible meeting space, on-site catering, and a helpful staff. 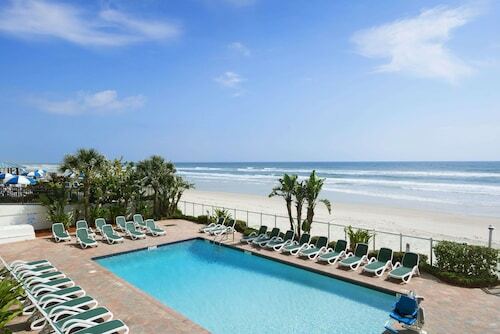 In between meetings, you can catch some waves in the Atlantic or catch some z’s by one of the 4 hotel pools. Wyndham Ocean Walk: The majestic palm trees and lush grassy areas help to create a tropical environment that is mirrored by the brightly colored décor in the guestrooms. 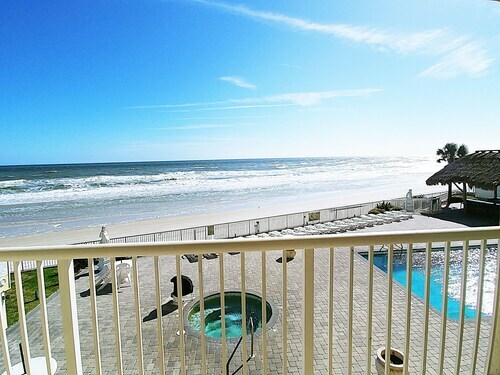 Watch the sunrise from the balcony of your oceanfront suite at one of the more popular hotels in Daytona Beach before a big day of doing as little as possible. Stroll along the sandy shore just steps outside the hotel’s front door, sip on a glass of wine while you ease into your poolside lounger, or float away your troubles on the hotel’s lazy river. Life can come at you like a stock car in the fast lane sometimes; you deserve a pit stop every once in a while. Let Travelocity help you book your stay at the speedway by the sand. 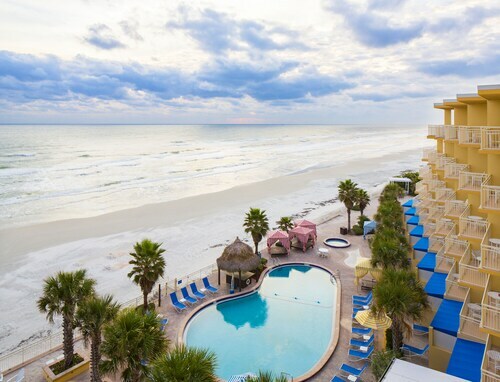 You’ll find great deals on a huge selection of cheap hotels near Daytona Beach, upscale oceanfront accommodations, and luxurious resorts throughout the area. With the money you save, you’ll feel like you’ve captured the checkered flag and are being doused with champagne in the winner’s circle. Need insider tips on must-see attractions in Daytona Beach? 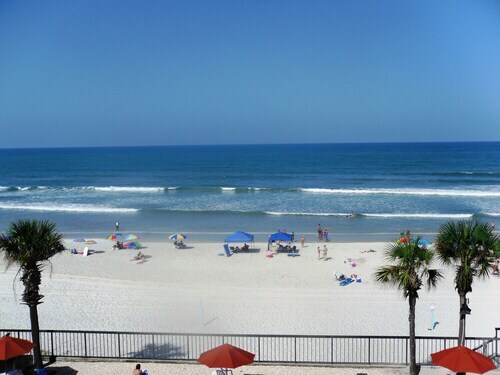 Check out our Daytona Beach travel guide! 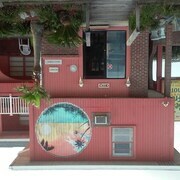 We really enjoyed our stay at the Bahama House! The Facility was clean and all the staff were super nice. Perry’s is a nice value. We chose it as a last minute destination. The grounds and beach are great. Plenty of lounge chairs and umbrella tables. All three pools were in perfect condition. Probably go back again! Advertised room that we thought we purchased was king size bed in oceanfront room. Assigned room at check-in was streetside. Ended up with double beds in the courtyard. Room was unfinished with no phone or clock, tv and/or remote did not work, no curtains, but did have blinds. Carpet was slightly damp. Bathroom wall had splatter stain, paint job was not clean (overpaint from short wall to lower ceiling (near bathroom). Ceiling looks like it had a recent repair that was never finished. Pee stain on sheets in one of the beds. Found a half drank bottle of Foreball whiskey under the other bed. Bikes for rent were pretty badly rusted. Door to room needs adjusting, daylight comes in through top of door. Continental breakfast is prepackaged pastries, and drinks were not stocked. Ran out of coffee and juice at 8 am and did not restock after another guest notified staff. Cereal was poured into a breadbox, with a bowl to scoop it out...but no milk to be found. Front desk ladies were super nice, though!